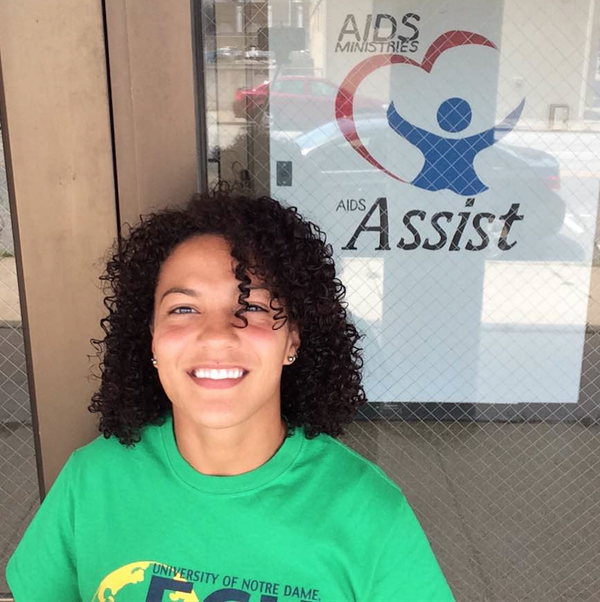 While many of our Master of Science in Global Health students traveled internationally for their Capstone in May and June, Kaila Barber ’15, ’16 MS, a Notre Dame Varsity Track Athlete, conducted her capstone research project in South Bend, Indiana with AIDS Ministries AIDS Assist (AMAA). AMAA is a local organization that provides care coordination services for persons living with HIV (PLWH) in North Central Indiana and free HIV testing and educational outreach for the community. Through the work of Notre Dame’s Assistant Professor Heidi Beidinger-Burnett, the Eck Institute for Global Health (EIGH) has developed a strong partnership with AMAA. Leeah Hopper, AMAA Executive Program Director, said, "Having a global health student complete a study on transportation and medical care for our clients was most beneficial. We were able to get an in depth look at transportation among our clientele.”Barber conducted a cross sectional, quantitative study to determine how transportation to health care facilities impacted the health status of PLWH in Northern Indiana. Using Geographic Information Systems and de-identified client data, Barber analyzed the relationship between distance traveled from client home to health care facility and the clients’ CD4 and viral load status. The study results found that the distance traveled to primary care providers and infectious disease specialists did not significantly impact health status. However, the research found study participants who were provided transportation by AMAA generally had a higher health status than study participants who were not provided transportation. This suggests AMAA was able to mitigate transportation as a barrier to care for PLWH. “With the results from the study, we were able to showcase the need for transportation and we are now included in a state pilot project. This new transportation project will allow us to provide transportation to our clientele at a low cost without relying on our case managers," stated Hopper. Barber’s data was shared with Indiana State Department of Health which resulted in AMAA being one of three organizations in the state of Indiana to qualify for a pilot program. Once a week AMAA will have a driver for their participants to utilize for transportation to and from appointments, lab testing, and other medical services. In addition to Barber’s study, EIGH has sponsored research projects with AMAA on Barriers to Care for PLWH Post Affordable Care Act and the Developing a Tool to Assess Knowledge Acquisition in HIV Prevention Education. The EIGH is a university-wide enterprise that recognizes health as a fundamental human right and endeavors to promote research, training, service to advance health standards for all people, especially people in low and middle-income countries, who are disproportionately impacted by preventable diseases. For more information about Notre Dame’s Master of Science in Global Health degree program, visit: here. Originally published by Ashley Scott ’13 MS at globalhealth.nd.edu on October 04, 2016.